8/22: Relax in the 2nd Floor King Master with private bathroom and balcony access. 9/22: Master bathroom with double sinks, separate shower & jetted tub. 10/22: Master bathroom with double sinks, separate shower & jetted tub. Welcome to Too Stinkin' Cute. It's a beautiful, 4 Bedroom, 3 Bathroom home that will be a perfect place for your beach vacation. There is room for everyone in the spacious floor plan, with accommodations to sleep 6 adults in king beds and up to 4 children in queen-over-queen built-in bunks (with additional sleeping space on a sleeper sofa in the living room). This home has been freshly painted throughout and features new furniture, quilts, and decor for a wonderful beach retreat! An ideal home for 2-3 families with children, or groups of 8-10 adults max. Or if you have a larger group, you can also rent So Stinkin' Cute house next door. Together, they offer 8 bedrooms! We keep all our homes clean and well-updated and pay attention to amenities you expect, such as high-speed internet, nice flat-screen TVs, high-definition cable, hair dryers in each bathroom and more. We also provide items our smaller guests may need like a high chair and pack-n-play. Walk into the SPACIOUS LIVING ROOM with crown molding, Brand new sleeper sofa, loveseat, and chair a flat-screen TV. It’s a great place to relax after a day of fun at the pool or the beach. The living area is open to the kitchen and dining area, so there is plenty of room for your group to enjoy time together. The DINING AREA seats 8, with seating for more at the large kitchen counter. You’ll enjoy cooking in the BEAUTIFUL KITCHEN with plenty of counter space, stainless steel appliances, and a convenient pantry. We want you to feel at home right away, so we have equipped this kitchen with a blender, toaster, hand mixer, brand new dishes, flatware, professional Calphalon cookware, Keurig K-Cup coffee maker and a regular drip coffee maker. The pantry is also stocked with a few essentials to get you started like spices, foil, cream, sugar, etc. LAUNDRY ROOM – You’ll certainly appreciate the spacious laundry room in this home. It’s conveniently located on the main floor and includes a full-size washer & dryer, storage shelves, an iron and ironing board. On the main level, you will find a large, private bedroom with a BRAND NEW King bed with custom headboard, lovely quilt, and super-soft Egyptian cotton sheets. There are two night stands with reading lamps, a large dresser, extra-large closet, and HDTV. Adjacent to King Bedroom #1 on the main floor, the well-appointed full bathroom features a commode, vanity with sink and a tub/shower combination. The bathroom is equipped with a hairdryer and large, fluffy bath towels. This extra-large King Master Suite features a king bed with super-soft Egyptian cotton sheets, two nightstands and reading lamps. You will appreciate the flat-screen plasma TV, 2 large closets, and the room darkening drapes (so you can sleep in or take an afternoon nap while on vacation.) There’s also access to the balcony from this room; a great place to relax! This large private bath is attached to Bedroom #2- King Master Suite. It features a commode, a large vanity with double sinks, a jetted tub, and separate tile shower. It is equipped with a hairdryer and large, fluffy bath towels. Also on the second level is this comfortable King Master Bedroom which has a BRAND NEW King bed with super-soft Egyptian cotton sheets. It features a flat-screen TV, a large dresser, bedside table, and reading lamp. Another entrance to the large balcony is just down the hall. Enter this well-appointed full bath from the 2nd-floor hallway. It features a commode, vanity with sink, and a tub/shower combination. It is also equipped with a hairdryer and large, fluffy bath towels. Children will love this freshly painted room with a BRAND NEW queen-over-queen built-in bunk beds with fun new “fishy” quilts. There’s also a flat-screen TV mounted on the wall in this room. Children will share the full bathroom just down the hall. BEACH and POOL – This home in the Villages of Crystal Beach offers the best of both! You’ll enjoy resort-style amenities including a lagoon style pool with 30,000 square feet of gorgeous, sparkling clean water, with a walk-in area, three waterfalls, spa and lavish landscaping. There are plenty of seating areas for your group to enjoy. When you’re ready to feel the sand between your toes, walk the short 4 blocks to the beach, or hop on the free, seasonal trolley, running from Spring Break to Labor Day. 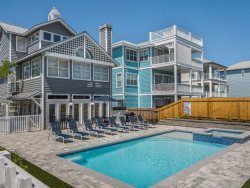 Crystal Beach is a charming seaside community located across from the Bass Pro Shop on the East side of the city of Destin. It's a terrific residential area, yet close to restaurants and activities. Walk to Twirls Frozen Yogurt, Marble Slab Creamery, Subway, Cracker Barrel, Chili's, Olive Garden, Outback Steakhouse, and a lot more. Destin Commons, a beautiful upscale shopping and entertainment center, is right across Hwy 98. It features over 75 shops and restaurants, including World of Beer, Panera Bread, Uncle Buck's Fish Bowl & Grill, AMC Theater with IMAX and much more. Nearby are 6 miles of paved trails - perfect for both walking or biking. Beach Bliss has parking enough for two cars in the driveway, as well as an additional overflow parking lot. You and your group will have an unforgettable vacation at Beach Bliss.